Ladies you do not want to miss this weekend getaway! If anyone wants to come in on Thursday night the rate will be $150.00 for that night. The weekend starting on Friday; Includes, a week-end full of scrapbooking (traditional or digital), fun, food, fellowship, door prizes, gift bags, new ideas, handouts, & teaching sessions. 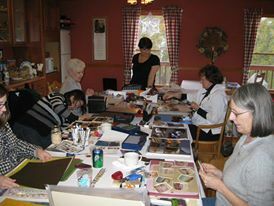 We have a great group of sweet/fun ladies who attend year after year. The food, hospitality, accommodations, & mountain view are wonderful!